When This Pup’s Favorite Toy Is In The Washing Machine He Provides Him Moral Support! 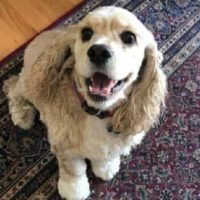 All pups have their favorite items – and for Habs, that item is definitely, 100%, without a doubt his precious teddy bear. 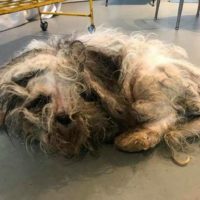 When a dog with fur so matted that his breed was completely indistinguishable was rescued by officers, he was rushed by officers to San Antonio Animal Care Services. 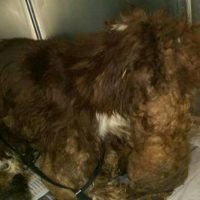 A medical team sedated the pup and quickly went to work, cutting away matted fur until they had shaved off 6 pounds’ worth of fur. When Sang Su was rescued from the Chicago streets, he was in such bad shape that it wasn’t clear what breed he was. 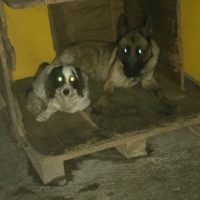 Edith Govea took a trip to San Luis Potosí is Mexico to visit a relative, but while she was there, she saw something that she believes to be a perfect example of true love and friendship. 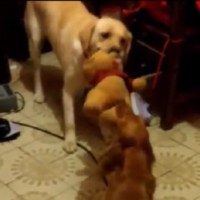 What Happens When Two Of Your Pups Want The Same Toy?! Tug of war is a battle of pure strength. There may be some strategy involved, but the winner is usually the one who pulls the hardest!